With the rise of the new religion of Islam, the Arabs started a new empire centered on Syria. Soon the Arabs conquered Egypt, too. So, just like the Assyrians and the Persians, now West Asian Arabs ruled Egypt. Gradually most Egyptians converted from Christianity to Islam (the remaining Christians in Egypt are called Copts (you say KOPTS)). Egyptians learned to speak Arabic. The Arabs built a new capital in the north at Cairo (you say KYE-row). For a while around 1000–1300 AD, the Egyptians became independent of Asia under the Shiite Fatimid dynasty. This was a time of great achievements in Egypt. But then the Sunni Ayyubids, and then the Mamluks conquered Egypt again. At first Egypt did well under the Ayyubids and the Mamluks. 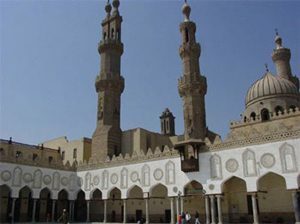 Maimonides lived in Cairo in the 1100s. Egypt became a big center of manufacturing, selling sugar and cotton and paper to the Italian traders of Genoa and Venice in medieval Europe. But the bubonic plague – the Black Death – of the 1300s AD killed many people in Egypt and made Egypt less well organized. Then civil wars among the Mamluks let Europe get ahead and start making its own paper and sugar. By the 1500s, Europeans used slavery to start growing sugar and cotton in the Americas. Around 1500 AD, Egypt became part of the Islamic Ottoman Empire, which held Egypt until modern times. Under Ottoman rule, the sultans in Constantinople taxed Egypt to support luxury lifestyles for themselves, and to pay the army. They brought a long peace, but they didn’t leave enough money in Egypt so that Egyptians could afford to send their children to school, or start factories, or build roads or bridges or canals. Egypt, like the rest of the Ottoman Empire, fell further and further behind Europe, and by the 1700s, Europeans like Napoleon – first the French, and then the British – were beginning to invade Egypt and take Egypt’s money for themselves. Cite this page: Carr, K.E. Egypt under Islamic rule. Quatr.us Study Guides, June 14, 2017. Web. April 23, 2019.